Zoopolis (OUP, 2011) is a book written by Sue Donaldson and Will Kymlicka. Its ambition is to offer a political theory of animal rights. The project in itself is quite ambitious and rests on a simple idea: we have more than one identity. In current societies we can be at the same time, citizen, employee, parent, human… Each identity refers to a specific normative corpus. The notion of citizen refers to the political, employee to labour rules, parent to family law and the human to human rights. 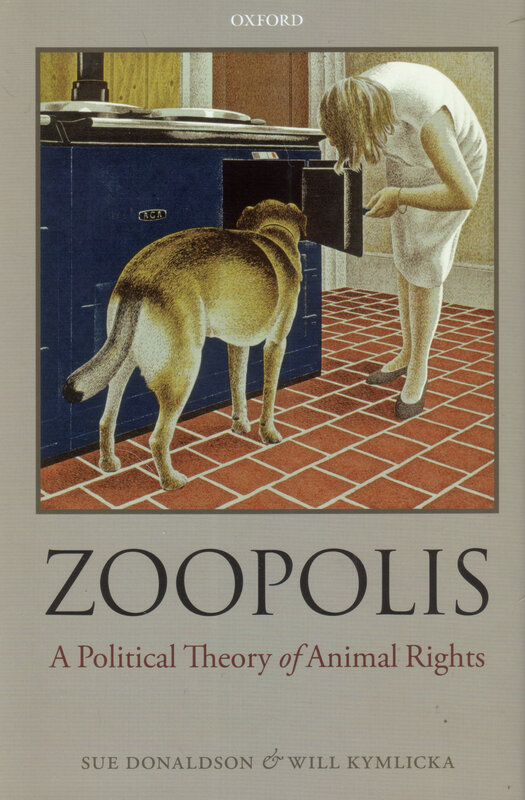 What the authors of Zoopolis underline is that the debate on animal rights has been excessively focused on the question of the fundamental rights, as if all the debate on humans were focused on what we call human rights. It is time, according to the authors, to offer a deeper study of the (potential) norms that could structure ideal relations between animals and the humans. What would an ideal society of human and animals look like? What norms would structure their relations? The goal of the authors is to build on political philosophy to propose a “theory of positive relational rights” between human and animals (p. 8). The model of human/animal society offered by the authors can be summarized as follow. Three types of animals are differentiated. The domesticated animals, living with the humans; the “liminal animals” sharing human territory but with few or no interaction with humans; and finally, the wild animals living outside human territories. For each kind of animal, the book offers a normative model. For domesticated animals, the books submits the idea of co-citizenship and offers a model in which animals have rights, responsibilities (to provide social interaction, to mow the lawns,…) as well as political agency (animal representative should be sent to the parliaments). For liminal animals, the book submits the idea of a statute located between citizen and alien: denizenship. These liminal animals would be granted right to residence but other rights would be more limited than the ones granted to domesticated animals. Finally, wild animals would be granted “animal sovereignty”. This latter category is of particular interest for international lawyers. It basically offers to extend the idea of ius gentium to non-human communities by granting them what is at the core of current international law: international sovereignty. “We argue that a helpful way to identify (wild animals / humans) relations is to think of wild animals as forming sovereign communities, whose relations is to sovereign human communities should be regulated by norms of international justice (p. 157)”. The proposition of the authors is that wild animals become a new form of gens. My point here is not to criticize the idea of the authors (I am about to do it in another forum) but to point out elements that I think will interest international lawyers. According to the authors, the relationships between human and wild animals should be based on 4 features. The three first ones are a mere extension of what the authors perceive as being the current state of international (human) law: the prohibition of colonization (1), the prohibition to intervene in matters within domestic jurisdiction of independent communities (2) and a strict regulation of “humanitarian interventions” (3). The last feature strays from the classic conception of sovereignty as it pleads for a more flexible link between sovereignty and territory (4). 3. the intervention should be conducted in a way that does not undermine the future independence of the animals (p. 181). The authors underline that animals are migrating and roaming the planet sometimes with no territorial base. This calls, according to them, for a more flexible definition of sovereignty. They for example refer to the idea of animal corridors and other forms a shared or overlapping identities that would based on historical examples (of arrangement between states and nomadic tribes) and based on a ethic of fairness (p. 194), equity, reciprocity and compensation (p. 205). These four propositions for an interspecies law raise more questions than they answer. The very definition of the entity that would be granted sovereignty is not the least of them. The authors seem to be willing to grant animal sovereignty to all animals “living apart” from the humans, apparently using a territorial basis for their definition. But even them recognize that an “animal territory” is something that rarely exists, mainly because lots of animals do not stay confined to one specific area but tend to roam and migrate. If so, aren’t they “liminal animals” which, according to the same authors should be granted less rights than the “wild animals”? In any case, who is to speak for animal interests (on that note read Meijer “Political Communication with Animals”)? How can human rights (of property, or of freedom of movement) be articulated with these propositions? Wouldn’t it be more ambitious to create an interspecies normative model anew rather than mainly reproducing (for interspecies relations) the territorial, vertical and confrontational structure of current human international law? Doesn’t the profoundly interdependent logic of ecosystems ask for a more horizontal and collaborative legal model? Well, as you see, if the quality of a book is measured by the number of questions it raises, Zoopolis is definitely a good read for international lawyers.